Sybil Phoenix was born on 21 June 1927 in Georgetown, Guyana. When Sybil was nine years old her mother died and she went to live with her grandfather until his death when she was twelve. For the remainder of her childhood she lived with an aunt and uncle who unfortunately did not treat her so well. The need for appropriate care and nurturing of young people has remained a driving force for Sybil Phoenix ever since. Sybil came to England in 1956 with her future husband, Joe, whom she married in June of that year. During their early years in England they experienced racism and hostility for the first time, both when looking for accommodation and at their local church. At this time Sybil was already involved in the community by working at a youth club in Hammersmith. She also worked in a milliners and as a canteen cook (the first Black cook employed by Forte). During this period her first two children were born. In 1962 Sybil and her husband Joe moved to Brockley where the real work began. She added to her family, gave up her canteen job, started to foster children and expanded her work in the field of youth and community instead. Over the years Sybil has become foster mum and aunty to hundreds of young people. In 1973 Sybil suffered a personal tragedy when her daughter Marsha was killed in a road accident. Sybil herself was also badly injured. Out of this immense tragedy Sybil found the will to go on and one positive achievement was the foundation of Marsha Phoenix Memorial Trust, a home for young women in Lewisham. Sybil Phoenix is a tireless worker on behalf of the many in our society without the power to be heard. How she finds the time, energy, strength and enthusiasm to give so much to the community is beyond most people's comprehension. It has been said of her: "Sybil has a tremendous capacity for loving in the face of hatred, rejection and discrimination"
Sybil Phoenix will, without fear of the consequences, take up the cudgels on behalf of her community be it with influential national leaders, from the pulpit or by speaking with children at the local school. Outlined below are just some of the achievements and contributions that this very remarkable black woman has made both to this society and internationally. Youth and Community Work Diploma awarded in 1976 by Avery Hill College. Counselling Qualification awarded in 1976 by Lincoln Memorial Clinic of Psychotherapy. Christian and Marriage Guidance Counselling awarded in 1978 by Christian Foundation of Psychotherapy. Trained and ordained as a Local Methodist Preacher. Methodist Church Representative on Churches Together Lent Course 1994. Methodist Representative at Christian Aid Organisation. Member of British Council of Churches serving on Migrant Committee. On behalf of British Council of Churches has run workshops in Europe including France, Germany and Holland. Founder and current Chair of Pagnell Street Youth and Community Centre - This project was the first of its kind to establish a purpose built centre for the Black community, open to the whole community. Sybil alone raised £64,000 to commence the project and was instrumental in raising a further £750,000 to see the project to fruition. Founder and Chair of Marsha Phoenix Memorial Trust - A home for 21 young women who would otherwise be homeless. The young women are taught life skills to enable them to maintain independent living once they leave this sheltered environment. Additionally there is a 6 bedded second stage house for those young women who need extra support before moving on to independent accommodation. In order to make this better life project a reality Sybil Phoenix, together with the Parents Association, fund raises on a continuous basis in order to maintain this self financing project. Founder of Guyana Connection - A project established to improve children's education by establishing international exchange visits for children in order to learn computer technology. The exchange also gives young people in Guyana and both black snd white children in Britain the first-hand opportunity of living and working with another culture. Sybil raised an initial £45,000 in order to provide computer equipment for five schools. This project is supported by The Commonwealth Youth Exchange Council. Founder Organiser of Methodist Leadership Racism Awareness Workshops - Sybil recognised the need for, established and now runs racism awareness courses on behalf of the Methodist Church which she calls "Respecting Human Dignity Workshops". These courses have become a compulsory element in the training of Methodist Church Leaders and Ministers. President of Friends of Sydenham Girls' School - Aims to support the school. Sybil takes regular assemblies at this and other schools in the locality. Honorary Vice President of the National Council of Women of Great Britain - The first black woman to be elected as Vice President. The NCW works to promote the interests of women in this country. Director of Umojo Theatre Company - This charitable company aims to produce quality works of theatre predominantly for the Black community. Founder and Vice Principal of National Out of School Alliance - The Alliance aims to provide out of school clubs for latch-key children. Founder Member of Centre for Caribbean Studies - Group that sought funding and established a centre for Caribbean Studies in Lewisham. This centre is now incorporated within the structure of University of London, Goldsmitns' College. Founder Member and Past Chair of Lewisham Racial Equality Council - The Council was formed to promote the rights of each individual in the community to have racial equality and justice. Chair of Lewisham's Association of Voluntary Youth Organisations - This organisation was formed to look after the interests of voluntary youth groups in the area, ensuring appropriate staffing levels and equipment are provided. Chair of Parents' Association - A local Association established to represent the interests of children expelled and excluded from school. Branches have also been established in neighbouring boroughs. Chair of Bodytorque - Bodytorque is a dance and exercise project that works primarily with schools and senior citizens encouraging using dance and exercise to keep fit. Chair of Local Steering Group for People For Action and member of the National Board of People For Action - The group has been established as a development agency to regenerate the economy in the local community and surrounding area. Chair of Turning Point - A voluntary organisation that pioneers training methods and approaches. It offers a Diploma of Higher Education in Community Work to working class Black and White people without educational qualifications. Vice-Chair of Lewisham Environmental Trust - The Trust aims to look at preserving buildings of note within the Borough of Lewisham as well as protecting the green space. The Trust has been working with the Lewisham 2000 Project rejuvenating the city centre. Member of Deptford City Challenge Evaluation Project - A group established to support and advise a Research Team from Goldsmiths College which has been appointed to conduct an evaluation of the Deptford City Challenge urban initiative. Member of British and Foreign School Society - Sitting on the Overseas Volunteers Committee including interviewing and selecting exchange applicants. Member of Married Women's Association - Active member of this association that promotes the recognition of a wife as a legal and equal financial partner during marriage. Member of Board of Inter-Action - An educational charity established to provide computer literacy and information technology. Past Member of Manpower Board - Lewisham Representative on National Board liaising with Home Office on training provision. In 1973 Sybil was awarded an MBE by Her Majesty Queen Elizabeth II in recognition of her outstanding work in the community. In 1987 Sybil was awarded the Medal of Service from her country of birth, Guyana, for her service to Nationals at home and abroad. In 1985 Sybil was presented with a trophy by the Caribbean Times in recognition of her services and achievements in the community. 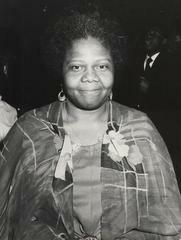 In 1992 Sybil was presented with an inscribed commemorative crystal bowl in recognition of her work as a Black woman. In 1992 Sybil was honoured for her outstanding contribution to the community by The Voice Newspaper. In particular for her "distinguished service to Youth and Church in Britain". In 1993 Sybil was awarded an Honorary Fellowship by University of London, Goldsmiths' College for her services to the local community. This award was presented by Her Royal Highness, The Princess Royal. Sybil has twice been an honoured guest - once during the 1970's in recognition of her fundraising work on behalf of the Pagnell Street Community Centre and again in 1993. In 1996, Sybil was awarded the Freedom of the London Borough of Lewisham in recognition for her service to the people and community of the London Borough of Lewisham. A reception was held in her honour. In 1999, Sybil exercised her right (as laid down in The Magna Carta) as a Freeman of the Borough by taking a flock of sheep over the Ladywell Bridge as a sponsored event, to raise funds for young homeless women. Sybil was presented with the Freeman of the City of London in 1998. An award ceremony took place at the Guild Hall in the City of London.